Toronto, March 22, 2018 - The Environmental Commissioner of Ontario (ECO) presented staff from three Ontario ministries with her ECO Recognition Award today for protecting Ontario’s pollinators. The multi-ministry team created a Pollinator Health Strategy and Action Plan that includes actions and dedicated funding to protect pollinators, which include certain species of birds, bees and other insects, and a commitment to ongoing research. 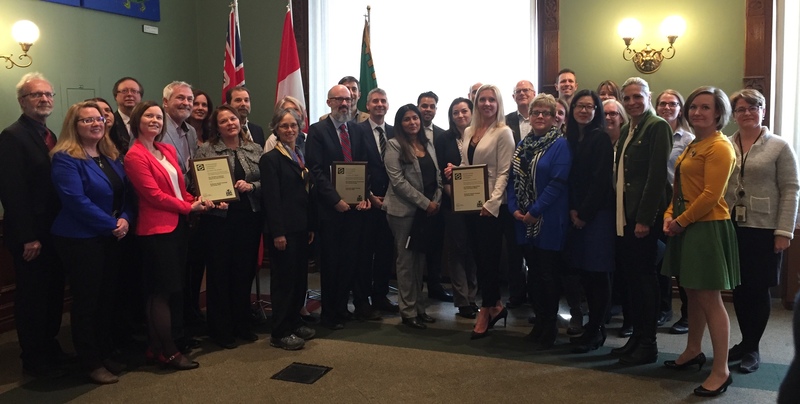 The province’s environmental watchdog presented awards to 63 staff from the Ministry of Agriculture, Food and Rural Affairs (OMAFRA), the Ministry of Natural Resources and Forestry (MNRF), and the Ministry of the Environment of Climate Change (MOECC) at a ceremony held at Queen’s Park. •	undertaking extensive consultation and communication efforts. •	protect, restore and enhance one million acres of pollinator habitat in Ontario. Public consultation, a key component of Ontario’s Environmental Bill of Rights, was an integral part of the development of the strategy and action plan. The ministries posted three proposals on the Environmental Registry, receiving over 80,000 comments from the public. Pollinators - insects, birds and other creatures that play a role in the pollination of plants - are vital to natural ecosystems and agricultural productivity all over the world. They are estimated to contribute over $990 million annually to Ontario’s economy. Ontario also has a managed honey bee sector, with an estimated population of 97,342 colonies and 2,896 registered beekeepers in 2016. The Environmental Commissioner’s Recognition Award recognizes Ontario civil servants for their work on projects that are innovative, go beyond legal mandates, better Ontario’s environment, and meet the requirements and purposes of the Environmental Bill of Rights. This year’s award was profiled in the ECO’s 2017 Environmental Protection Report, Good Choices, Bad Choices. Legislature who reports on government progress on environmental protection, greenhouse gas emissions and energy conservation. The ECO is the province's environmental watchdog and guardian of Ontarians' environmental rights. Dianne Saxe, Environmental Commissioner of Ontario, presents OMAFRA, MNRF and MOECC staff with the ECO Recognition Award at Queen’s Park.